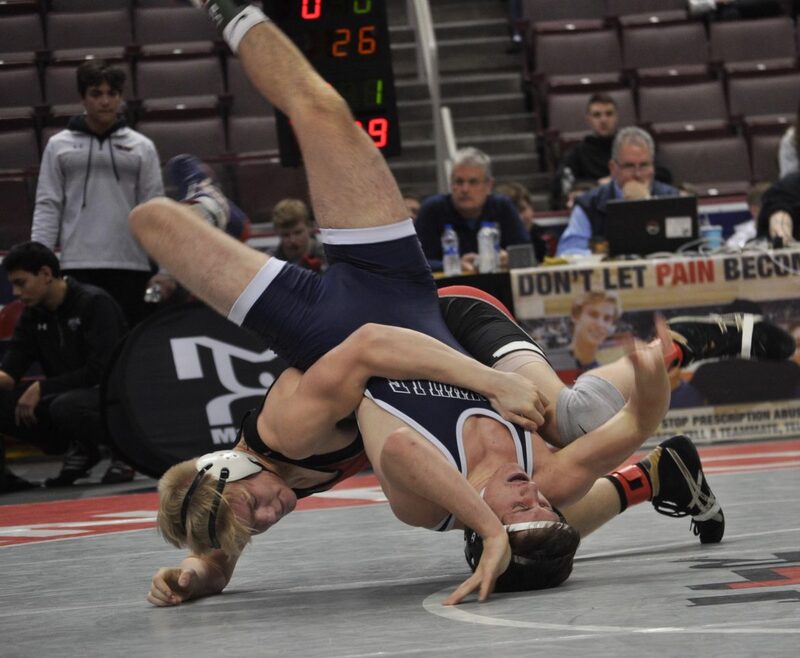 Josh Jones flattened his Brookville opponent in only :11 seconds. 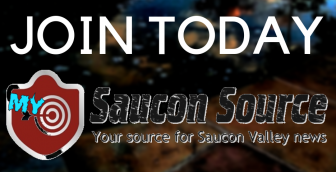 After being knocked to the consolation bracket by #1 Reynolds, the Saucon Valley Panthers refueled and regrouped for the opportunity to climb the podium against the Brookville Raiders. 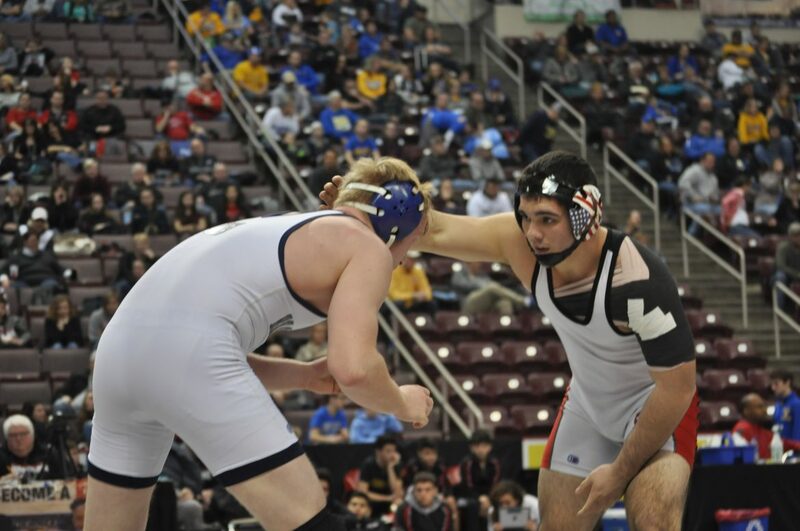 With a win against the Raiders, Saucon Valley would have a chance to wrestle for 3rd Place in the 2019 PIAA state wrestling championships. The Panthers (21-2) fought the fight, but it was Brookville who came out on top with a 33-32 victory. Freshman Ty Csencsits looking for back points. 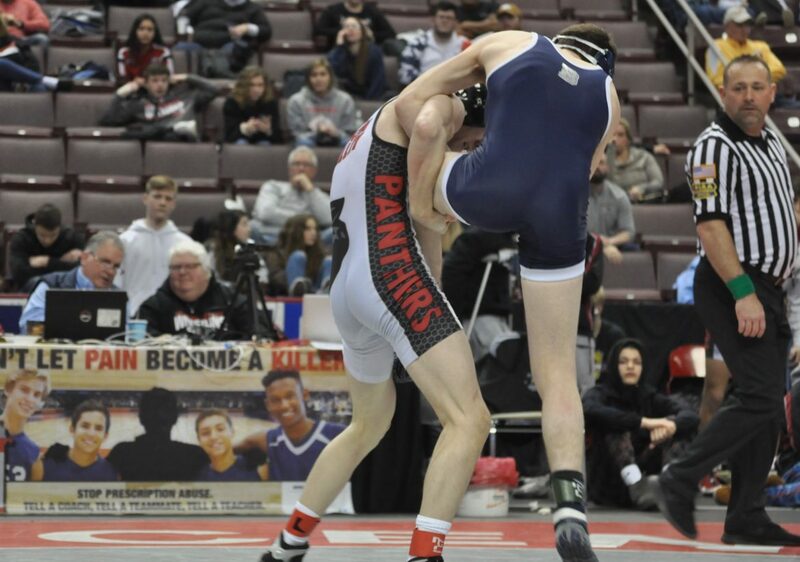 With Saturday’s action starting at the 160 pound weight class, Saucon Valley freshman Ty Csencsits (18-9) got things off to a great start for the Panthers. Csencsits used four takedowns and three near-fall points to earn an 11-4 decision. Dance Csencsits picks up six more for the Panthers. Brookville would answer with decisions at 170 and 182 before Ty’s brother Dane hit the mat at 195. Dane Csencsits (30-6) hit his eighteenth pin of the season to reclaim the Panther lead with a 9-6 team score. Brookville bounced back winning the next four bouts including three pins. 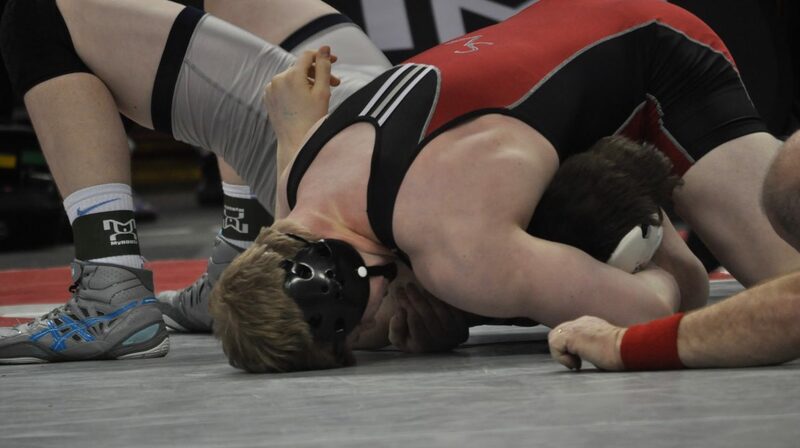 With six bouts remaining, the Panthers found themselves in a 27-9 hole. Saucon Valley junior Kevin Dyer claiming three near-fall points. 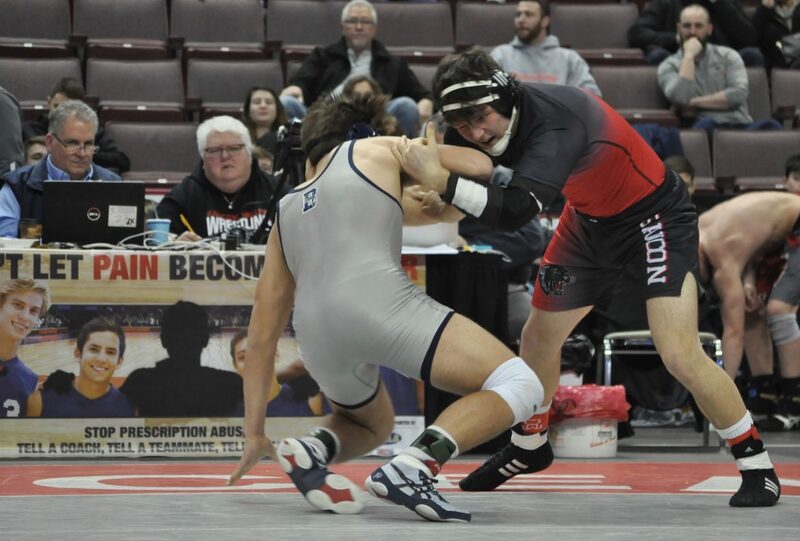 Junior Kevin Dyer (120) did his best to swing momentum back for the Panthers with his 9-1 major-decision, but Brookville extended their lead with another fall by senior Cabe Park (126). With four bouts yet to be wrestled, Saucon still had a chance with the scoreboard reading 33-13. 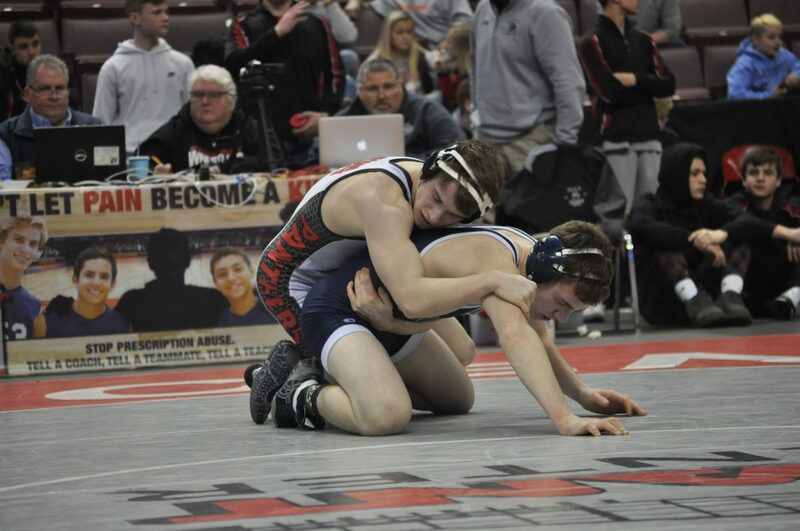 Junior Thomas Spirk converted four, third period takedowns to win a major-decision against the Brookville Raiders. Down by twenty points, the Panthers needed to run the table to win the match and advance. 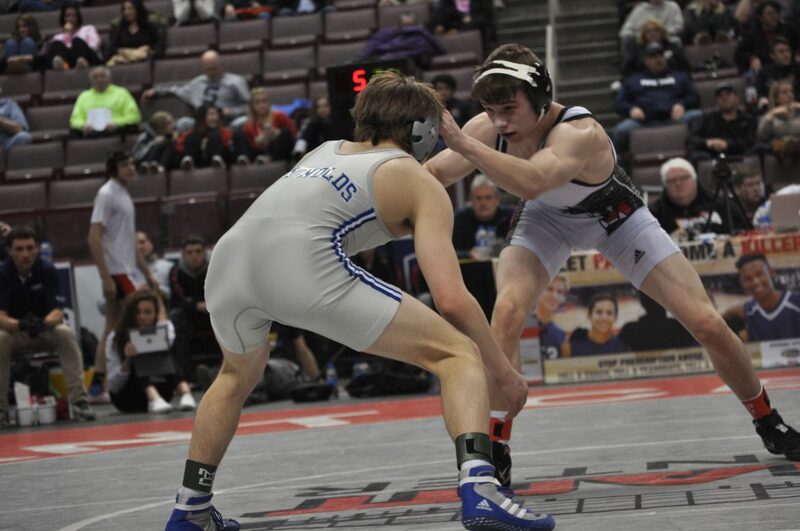 Josh Jones (132) pinned his opponent in :11 seconds while Thomas Spirk (138) capitalized on five takedowns and a couple of reversals to hit a 14-6 major-decision. Spirk’s victory made the score 33-23 with two bouts to go. The door was still cracked open for another thrilling Panther victory. Saucon Valley’s Nick Rosengrant (bottom) fought hard for a takedown and a reversal for his 4-2 victory against Brookville. Saucon Valley senior Nick Rosengrant (145) earned a hard fought, 4-2 win against the Raiders which closed the Panther gap 33-26. 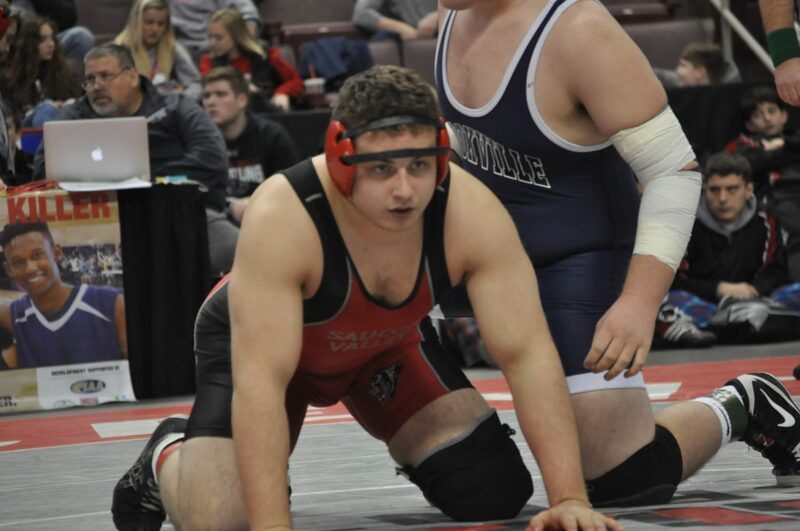 However, with only one bout left to wrestle and a seven point deficit for the Panthers to overcome, Brookville conceded the six-points and forfeited to Panther freshman, Dante Mahaffey (152). 106- Owen Reinsel Fr., Brookville, pinned Cael Markle Fr., 2:22. 113- Cayden Walter So., Brookville, pinned Cael Markle Fr., 1:17. 120- Kevin Dyer Jr., SV, major-decision Josh Popson Fr., 9-1. 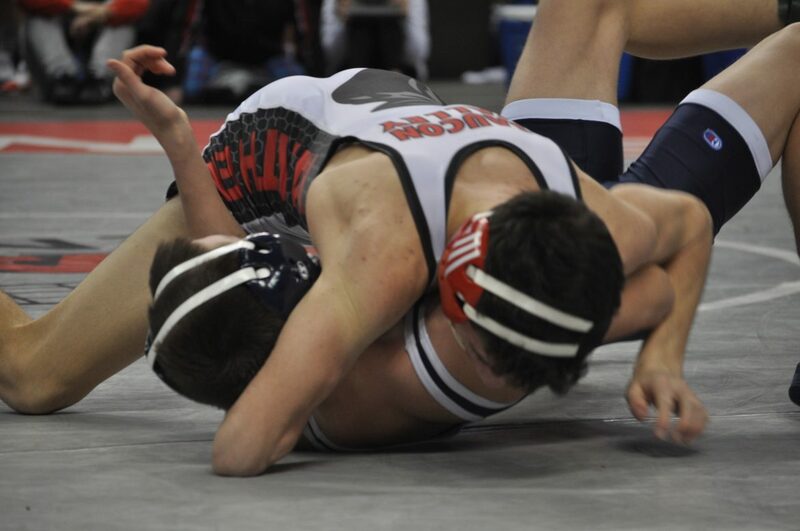 126- Cabe Park Sr., Brookville pinned Ryan Gilbert Fr., :31. 132- Josh Jones Sr., SV, pinned Parker Fleming Jr. :11. 138- Thomas Spirk Jr., SV, major-decision Wyatt Kulik Jr., 14-6. 145- Nick Rosengrant Sr., SV, decision Cody Hetrick Jr., 4-2. 152- Dante Mahaffey Fr., win by forfeit. 160- Ty Csencsits Fr., SV, decision Wyatt Griffin So., 11-4. 170- Elliot Park So., Brookville, decision Jarrett Hirschbeck Sr., 12-8. 182- Braden MacBeth Sr., Brookville, decision Braydyn Lugardo Jr., 3-2. 195- Dane Csencsits Jr., SV, pinned Nathan Taylor So., 1:43. 220- Tanner LaBenne Sr., Brookville, decision Jared Harka Sr., 6-2. 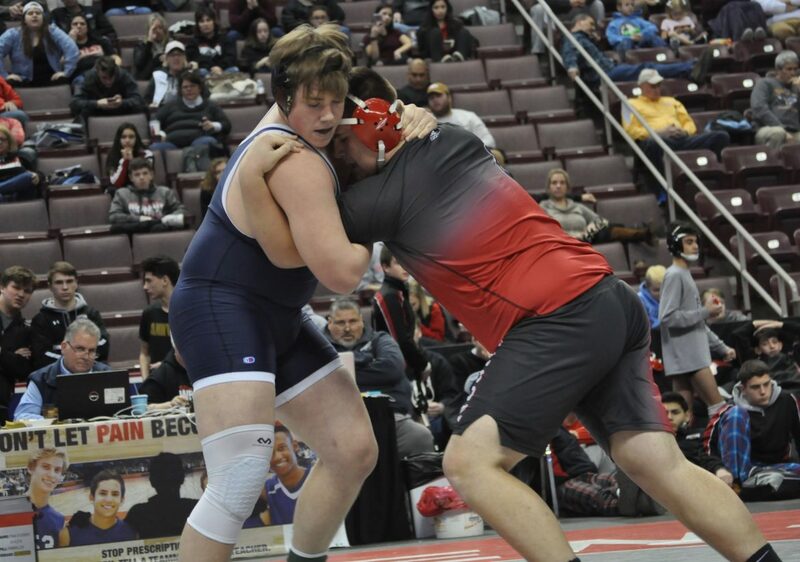 285- Colby Whitehill Jr., Brookville, pinned Nick Warnke Jr., 4:41. 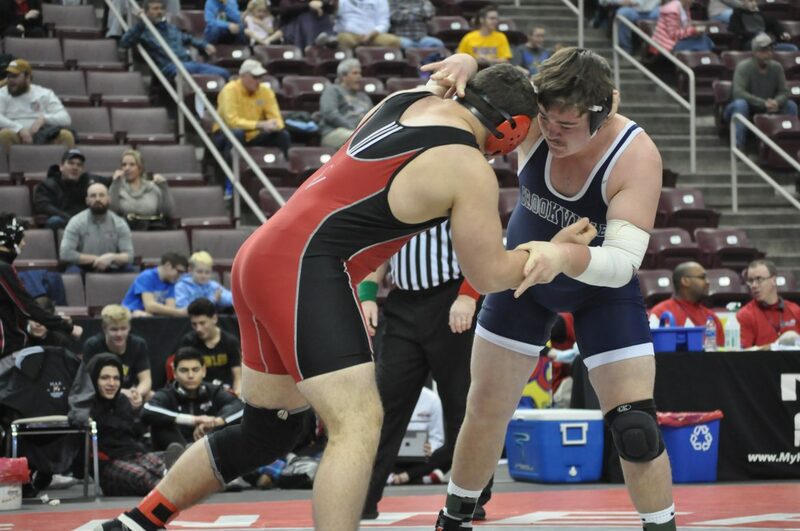 The Panthers battled but came up short in the 2019 PIAA state wrestling championships. Up Next: The Panthers will take a little time to heal and then get back at it for the PIAA District XI individual tournament.